Event Description Now in it’s 4th year, this grassroots, Canadian event, is a gathering that showcases all makes and models of vintage, custom and antique motorcycles. Focus on individual’s love for motorcycles, custom bikes and different artistic mediums. It’s a one day event of killer motorcycles, amazing art, live music, vendors, camping and all round good times. Come on out, have a great time and be a part of the creative culture. 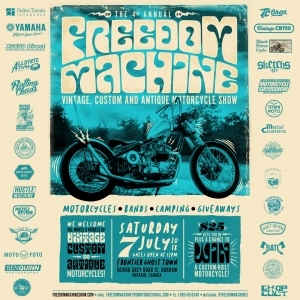 For more information go to www.freedommachineshow.com and follow us on Instagram.